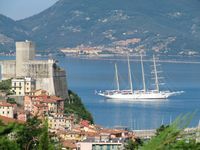 Properties in La Spezia average 4.5 out of 5 stars. Property 1: SCAGLIE DI MARE APARTMENT IN RIOMAGGIORE 5 TERRE. Nice view sea and village! Property 12: The garden of Riomaggiore, apartment at 5 terre. For 2 pax, Great Seaview, in private Med garden, pool, tennis, parking close to home. Property 21: For 2 pax, Great Seaview, in private Med garden, pool, tennis, parking close to home. Property 30: Smile home in the historic center of the city. Property 32: Apartment in the countryside a few steps from the sea of ​​Levanto and 5 Terre. 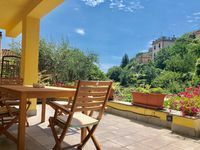 Property 34: Monterosso Al Mare: In the historical center of Monterosso.... special holiday in a romantic house with garden. The apartment was clean, spacious and tastefully decorated. It was perfect for our stay. The private gardens made for a very relaxing setting, even if just for morning coffee. We were delayed in our arrival and got in late but Carla was very patient with us and we really appreciated the breakfast items she left out for us. While the bus stop is close by, we walked the 1.2 km back and forth to the train station to get to Cinque Terre, and downtown La Spezia was just a little farther so the location was great for us. We were only there for two nights but the apt. was lovely. Mario greeted us and showed us where to park and gave us instructions for the place. There is about a 15-20 minute walk &ldquo;down hill&rdquo; to the area where the many sailboats are docked. Many restaurants to choose from. Just remember .... you walk down to get there ... you walk up hills to get home. Not too bad.